Hiking the Inca Trail to Machu Picchu is one of the world's premier treks that combines spectacular high Andean scenery & Inca ruins culminating at the glorious ruins of Machu Picchu. 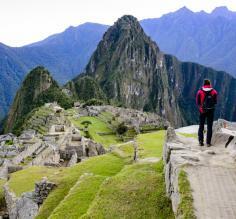 Permits to hike the Inca Trail are extremely limited and require reserving months in advance. 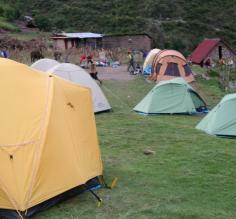 Most treks have four days of trekking and are offered as either standard class or luxury class outings. 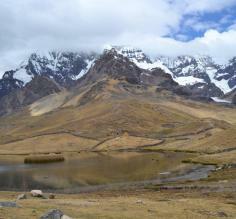 For experienced hikers, the breathtaking Salkantay trek takes you even higher into the Andes. Or, take an Inca Trail alternative like Choquequirao or Cachiccata. All treks require several days acclimatization to high altitude & a good level of fitness. Hiking the Inca Trail can be very challenging, but Adventure Life's Peru experts are here to assure trip planning is seamless and that you're prepared for the hike. Contact us for help planning a trip to the Inca Trail. Follow in the footsteps of the Inca on this classic Inca Trail Trek. Acclimatize for three days as you explore Inca ruins and bargain at busy Andean markets in Cusco and the Sacred Valley before embarking on the 4-day 25 mile (40km) trek on the Inca Trail to Machu Picchu. Spend a full day-and-a-half in the ruins of Machu Picchu before returning to Cusco on the train. 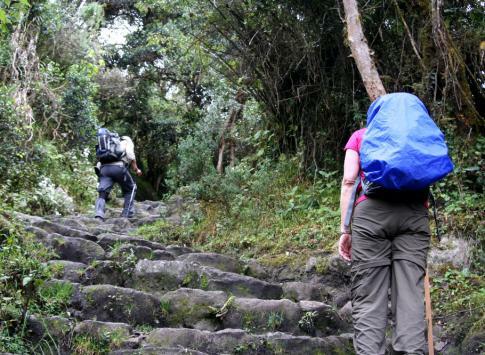 Hike the Inca Trail in style and comfort. This 4-day Inca Trail trek is combined with an upscale camping experience offering comfortable cots, hot water showers, and fine cuisine served under a portable dining tent. Top-shelf service and highly knowledgeable guides assure your once-in-a-lifetime trip to Machu Picchu is perfect. This extension of the Inca Trail brings you up close with sacred Andean glaciated peaks such as Mt. Salkantay. After exploring colonial Cusco and the Sacred Valley we begin our 6 day trek combining a scenic backcountry hike with the classic Inca Trail to Machu Picchu. One of our most popular Peru trips that starts in Lake Titicaca followed by trekking the Inca Trail is an exciting high mountain experience where we climb to nearly 14,000 feet culminating at Machu Picchu. To acclimatize for our trek, we spend a few days in Cusco and the Sacred Valley. We spend a few days in Cusco and the Sacred Valley during the Inti Raymi Festival every June as we acclimatize for our trek by exploring ruins and bargaining at busy Andean markets. Then, we'll hike the Inca Trail on a 4-day pilgrimage to Machu Picchu, culminating this 10-day trip with a full day in Machu Picchu. This 5-day trip spends 4 days hiking the Inca Trail then visits Machu Picchu for a full day exploring the ruins. 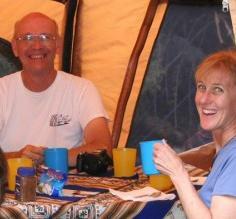 Hike with expert guides and enjoy deluxe camping to assure the best possible experience. We require that travelers spend a minimum of two nights at high altitude before the trek, usually in Cusco, Sacred Valley, or Lake Titicaca. The number of people allowed to hike the Inca Trail is limited to 500 people per day, and requires reserving months ahead of time in order to secure a spot. If you are unable to get a permit, or want to avoid the crowds on the main Inca Trail, there are excellent Inca Trail alternatives that highlight ruins, culture and spectacular high peaks of the Andes. Explore the colonial town of Cusco, and trek to the ruins of Choquequirao. The ruins can only be visited by two days or hiking so you'll be enjoying them with few other visitors. Visit with locals, wander through local markets, and tour Machu Picchu on this 12-day exploration. This active trek is challenging and rewarding all at the same time! The Cachiccata Trek is an excellent alternative to the Inca Trail. This cultural hike explores Peruvian history, and also visits modern Inca communities and customs. This route was cultivated by the Cachiccata community and your local guides will delight in sharing their culture and history. Come and discover this hidden trekking treasure of Peru! The Sacred Valley and Lares Adventure to Machu Picchu offers the perfect combination of traditional adventure travel and cultural immersion. This lodge-to-lodge journey will alternate between an exploration of the astounding natural scenery of the Sacred Valley and an intimate look at Andean culture, both in busy towns and in remote of mountain hamlets. Take a journey along the Salkanty trail through varied terrain both challenging and awe-inspiring. Up-close views of glacier mountain peaks, mysterious mist surrounding fields of boulders, and cattle drives through the most remote of mountain areas. Meet locals living in true Andean heritage giving you a glimpse into their rarely seen world. 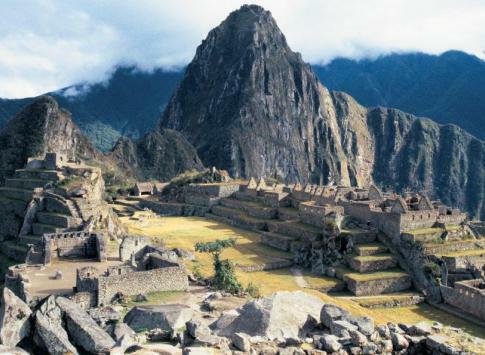 Learn about the Machu Picchu region's history, landscape, & people. We have answered many of the questions you might have about this journey of a lifetime. Get a better idea of the adventure ahead with this day-by-day description of the Inca Trail hike to Machu Picchu. The history, ancient sites, wildlife, and culture experienced along the Inca Trail make it popular among travelers. With so much to see along the way, this active method of exploring Peru provides a travel experience of a lifetime! The number of people allowed to hike the Inca Trail is strictly limited by the Peruvian government and permits sell out months in advance. Permits for 2019 go on sale in lottery-style in October 2018, so it is highly recommended to make your 2019 reservations before October 2018 especially if you want to hike during the high season from April to September. Altitude affects individuals differently, so until you have visited an area with high altitude it is impossible to predict how your body will react. Hiking trips should include some time to allow your body to begin acclimatizing to the 9,000-14,5000 foot altitudes of the Inca Trail. Learn more about preparing for this trek. The Inca Trail offers a hardy hike. Therefore, your appetite is sure to be the same! The quality of food that you will enjoy along this trek is impressive given the fact that it is all transported by your porters. This article gives you an idea of what you can expect to eat along your journey, including a sample menu. The Inca Trail is not the only extraordinary trekking opportunity in Peru! That is a good thing as passes fill up months in advanced. There are actually a number of excellent alternatives, and they have the advantage of being less known, and less crowded... Salcantay, Cacchicata, & Cordillera Blanca are just a few of these Peru treks. Hiking the Inca Trail is the classic Peru experience that many active travelers seek out. Trekking this ancient trail is not only physically exhilarating but it is an opportunity to learn about the culture and history of this magical place. Your steps will take you along a path upon which the Inca people themselves traveled! Truly an experience of a lifetime. The high travel season is May through August, and you must reserve your trek several months in advance (preferably before October of the previous year) in order to secure one of the limited spaces during these dry months of sun and warmth where it only rains a few days per month on average. Nights temperatures are cool, averaging around 32 degrees F (0 degrees C). During the entire month of February the Inca Trail is closed for repairs. The rains can be cold, and you need adequate rain gear (ponchos are great!) but average high temperatures are a pleasant 68 degrees F (20 C). The evenings tend to be warmer with the low temp averaging around 40 degrees F (5 degrees C) during the rainy season. Preparation is the key to enjoying the Inca Trail to its fullest. The 4-day trek is about 25 miles (40 km) long, and most importantly, at high altitude, so basic hiking fitness is required. Here's a day-by-day account to help you understand what to expect, what kinds of conditions, altitude and distances are involved. Altitude. The classic Inca trail ranges in altitude from about 9,000 ft. to almost 14,000 ft. (3,000-4,800m) and the highest campsite is at 12,600 ft (3,850 m). Everyone is affected by altitude differently, so the best way to know how your body handles altitude is to hike at similar altitudes before your trip. Then, upon arriving to Cusco, spend several days acclimatizing. To acclimatize gradually, spend a few days in the Sacred Valley and then Cusco. Stay well hydrated and consider taking hikes up to ruins like Sacsayhuaman, Pisac and Ollantaytambo before starting the Inca Trail hike. What to bring. Be prepared for cold and heat, sun and rain. Dress in layers, and most importantly, wear comfortable, well broken-in walking shoes or hiking boots. You'll need a small-sized backpack to carry snacks, a water bottle, raincoat/shell, and of course, your camera while you are hiking during the day. Arrieros, the Andean sherpas that accompany us, will carry all of our camping gear, and cooks will serve you hot meals in the evenings and picnic lunches with spectacular views on the trail. See our Inca Trail FAQ for details of what you should bring on the trek and what you should leave in Cusco. Adventure Life arranges and pays for your combined Inca Trail permit, Machu Picchu entrance fee, all transportation, a guide, porters, and basic camping equipment. Feel free to contact an Inca Trail expert with any questions or concerns you have about best preparing for the Inca Trail. We'd love to help! The tradiitonal Inca Trail hike begins as you disembark the Cusco to Machu Picchu train outside of Ollantaytambo at "kilometer 82". 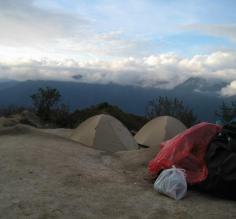 Put on your hiking boots and start the mostly uphill hike to your first campsite at Huayllabamba. 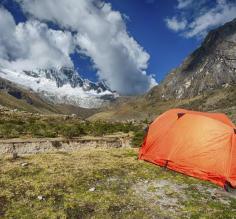 You'll spend three nights camping and arrive to glorious Machu Picchu on the fourth day. Here's a summary of each days' hikes and camps. 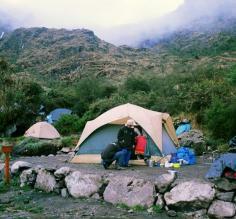 Campsite for Day 3 on Inca Trail hike to Machu Picchu. Camp elevation: 12,067 ft (3678 m) Hike distance: 4.5 miles (7.3 km) Highest hiking altitude: 13035 ft (3973 m) Two gentle passes today. Inca Trail Day 4: Arrive to Machu Picchu! Optionally wake up early to arrive at the Gate of the Sun as the sun rises over the ruins of Machu Picchu! Explore the ruins all day at your leisure and with your knowledgeable guide that uncovers the greatest legends and stories about Machu Picchu. We have been taking elated travelers on the Inca Trail for over 20 years, and have been refining and perfecting the itinerary to provide the ultimate Inca Trail experience. 1) Group Size - we organize treks for as few as 2 people. Average group size is 4-6 and our group size never exceeds 12. 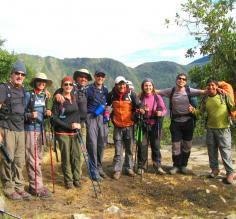 Many other trekking companies have groups with over 20 people. 2) Best Guides - not only do you have fewer travelers per guide, but we've got the best guides hands down. Day in and day out, these guides are the unsung heroes whose efforts create amazing experiences for travelers. Read all about them here. 3) Improved Route - we use less crowded campsites than most operators that more evenly spread the distance each day, and on the last day, we avoid starting to hike in the dark. You get a better experience on the Inca Trail and at Machu Picchu. Be prepared for hiking the Inca Trail with this comprehensive packing list for camping and trekking the world's most famous trek.